Goodnight Baby Moon is a gorgeous, sturdy board book with a fabulous cover that lights the moon up at the press of a button! It’s a beautiful, beautiful rhyming introduction to the different phases of the moon. The Story: A family of rabbits watch the moon over a series of nights and notice that the moon is getting smaller. One night the moon has completely disappeared! Slowly the moon returns and the rabbits learn that even though it has disappeared it will always come back again! With only five double spreads this book is the perfect size for the littlest of people. Each spread shows the rabbit family silhouetted against the night sky as they take their evening stroll and as we counted the rabbits we realised that the family grows throughout the story! The rhyming text is beautiful, easy to read and it repeats key words. This repetition also makes it a good book for a beginner reader. We love the illustrations and the use of the black silhouettes give them a layered look. Our favourite is the final one showing the two parents silhouetted against the moon, my daughter loves the little bunny in the burrow. We love the light on the cover (pressing the button is slightly addictive! ), it makes the silhouettes of the rabbits look beautiful in the silvery moonlight. 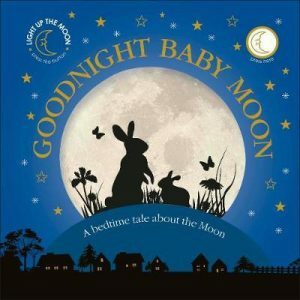 Goodnight Baby Moon is a great example of a story that introduces a simple, everyday concept to toddlers and young children and it shows that early learning can be enjoyable and fun. It’s also a wonderful bedtime story which can encourage little people to watch how the moon changes as they say goodnight! Thank you to Dorling Kindersley for sending Goodnight Baby Moon. It’s a beautiful introduction to the phases of the moon. Sounds lovely! I put it on my wish list – my cousin’s 1-year-old is bilingual German-English, this would be a lovely book for her to read with her dad. It looks beautiful, I like the silhouette and the fact that the moon lights up.